Using cutting-edge augmented reality, Trio NAE helped the Construction Center of Excellence engage with a new generation of tech-savvy students. Redesign the Construction Center of Excellence’s (CCE) Program & Resource Guide to appeal to the latest generation of students. Building on a previous design project and CCE’s updated website, Trio crafted an edgier, more sophisticated layout and design for the publication, including implementation of a structured grid system, unified typography, and helpful callouts in the Center’s signature orange and green. As we worked on shaping the handbook’s content, we saw an opportunity to introduce a cutting-edge technology that would help CCE attract and engage their target audience: device-savvy millennials. Utilizing augmented reality (AR) was much more than the “cool” factor that the 18-25 year-old group seeks through technology. 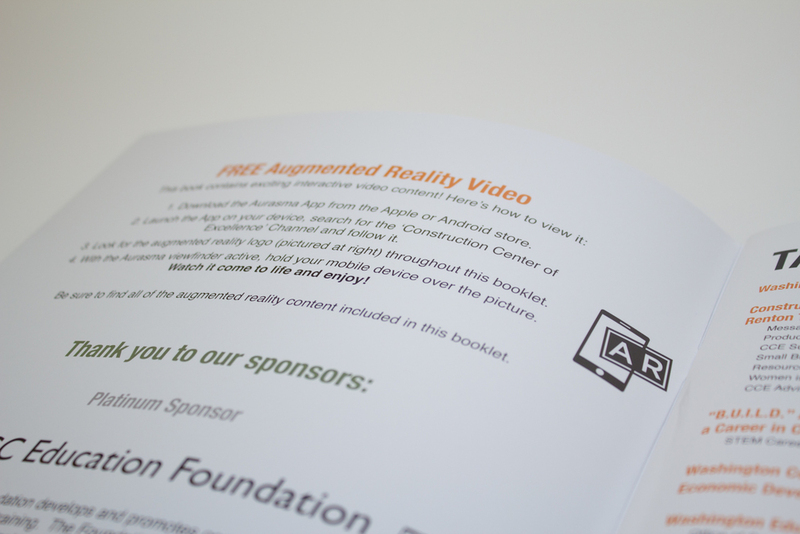 AR provided a unique opportunity to present web and video content directly to users as they browsed the handbook. 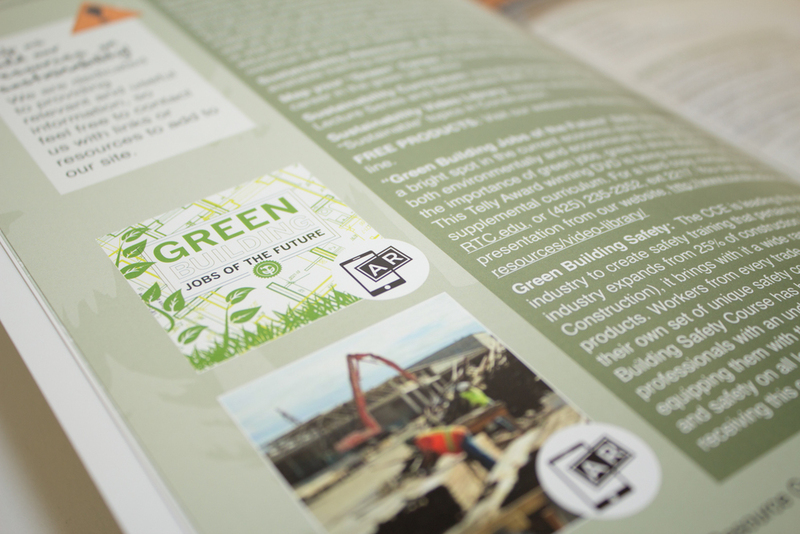 It enabled a simple print publication to extend into the digital sphere while offering an engaging interactive experience. At a major career fair in September 2013, student visitors to the CCE booth were three times higher than the previous year: 500 students interacted with CCE versus 150 in 2012. Of the students who visited the booth, 100% downloaded the AR app to interface with the resource handbook- taking a physical copy of the handbook with them, as well as providing CCE an opportunity to continue to reach them via the downloaded AR app. All other colleges present showed an interest in the technology and admitted that it was a clear differentiator to attracting students’ interest in CCE’s programs.